Description: The church is one of the most intriguing and significant institutions on earth. Because its essence and character are so widely misunderstood, this is a timely book. The church is not a mere human institution, though it is made up of human beings in community. Its roles and responsibilities are momentous, but all the elements of its organization came about as the church developed and attempted to fulfill its divine mandate, not as forms given at its founding. These papers from a Bingham Colloquium at McMaster Divinity College treat the church ""then"" in studies of the church in the various parts of the New Testament canon, followed by a historical study of the church under attack in places where it did not survive. 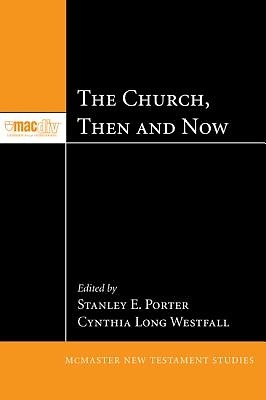 The latter part of the book contains essays by several church practitioners from ""now"" who discuss their insights about and experiences with postmodern society, home churches, megachurches, and the missional church. Such a combination of biblical theology, history, and practice makes this a valuable book for scholars and practitioners, in fact, for all thinking members of the church founded by Jesus Christ. Endorsements: ""We are living in a time of crisis in worldwide Christianity, combining vituperative attacks and persecution in several hotspots with a diminution of vision and understanding on the part of the church itself. This book comes at a critical time and addresses these needs. It provides both an excellent study of the NT witness as to what a church should be and penetrating insight into what churches actually are and what they are facing in our time . . . a must-read for church leaders and laypeople alike."" --Grant Osborne Professor of New Testament, Trinity Evangelical Divinity School Author of Matthew (Zondervan Exegetical Commentary Series, 2010) About the Contributor(s): Stanley E. Porter is President and Dean and Professor of New Testament at McMaster Divinity College in Hamilton, Ontario. His publications include eighteen books and over 250 journal articles, chapters, and related publications; he has also edited over seventy volumes. Cynthia Long Westfall is Assistant Professor of New Testament at McMaster Divinity College in Hamilton, Ontario. She is the author of A Discourse Analysis of the Structure of Hebrews: The Relationship between Form and Meaning (2006).